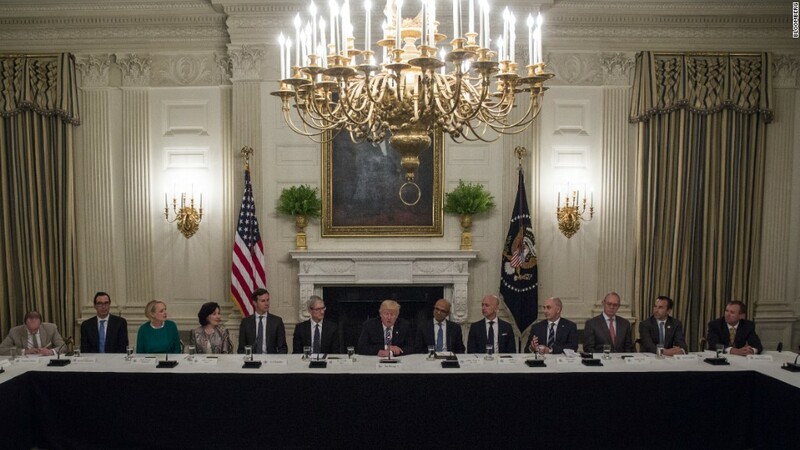 The CEOs of Apple (AAPL), Microsoft (MSFT), Amazon (AMZN) and Google's parent company Alphabet (GOOGL) joined more than a dozen other tech leaders for the first meeting of the American Technology Council on Monday. The group met with Trump and other members of his administration throughout the day. The main agenda, at least on paper: talk through ways to modernize the government's technology infrastructure. "Our goal is to lead a sweeping transformation of the federal government's technology that will deliver dramatically better services to the citizens [and] stronger protection from cyberattacks," Trump said in opening remarks. Trump introduced the tech executives as "special people" who employ "hundreds of thousands" of American workers and are "on the absolute cutting edge of innovation." The president was flanked by Apple CEO Tim Cook and Microsoft CEO Satya Nadella. Nadella called for continuing an "enlightened immigration policy" to boost "American competitiveness." The meeting comes after months of clashes between tech and Trump, including legal battles over both versions of Trump's travel ban and a rollback of protections for transgender students. Most recently, the tech industry criticized Trump over his decision to pull out of the Paris climate accord. Despite these clashes, the tech industry sees an opportunity. They hope to build a working relationship with the White House on the bipartisan issue of modernizing government. And there is potential to use the day's meetings to broach more sensitive subjects, according to attendees and those who work with tech companies on government issues. "This is really safe ground," says Stewart Verdery, a lobbyist with Monument Policy Group, which works with Amazon and Microsoft. "The question is, how much does the president bring up issues that are more controversial, or do the executives? All the stuff that made the relationship difficult, does that come up?" A source says Cook, in particular, was planning to bring up immigration, encryption, veterans affairs and the continued importance of human rights. Axios was first to report on Cook's agenda for the meeting. "At the end of the day, I'm not a person who's going to walk away and say, 'If you don't do what I want, I leave,'" Cook said in one recent interview about working with the Trump administration. "I care deeply about America. I want America to do well. America's more important than bloody politics from my point of view." The H-1B visa program, another issue on Monday's agenda, is also a top concern for Silicon Valley and its workers. When asked about Trump's earlier criticisms of the program, White House press secretary Sean Spicer said Trump "is going into this meeting to listen." Other execs are more focused on sticking to the modernization issue -- at least publicly. "We will be rolling up our sleeves and working through the hard issues of how to provide better services to citizens, how to use technology to enable better government decision-making, how to reduce fraud and waste, and how to accelerate moving to the cloud," Safra Catz, co-CEO of Oracle and a member of Trump's transition team, said in a statement provided to CNN Tech. Yet, there are concerns inside and outside the industry that this meeting -- like the first one in December -- will amount to little more than a photo opp benefiting Trump while doing little to advance tech's key causes. "This is not a decision I have made lightly," wrote Jennifer Pahlka, founder and executive director of Code for America, who is also attending the White House meeting. "I personally believe that, outside of the issues discussed at this meeting, the policies of the Trump administration are dangerous and harmful to the American public." There are some notable absences this time around. Elon Musk, CEO of Tesla and SpaceX, is not on the list. Musk quit two of Trump's business advisory councils earlier this month after the president's decision to leave the Paris climate agreement. Facebook was the only one of the top five tech companies that didn't attend. Nu Wexler, a spokesman for Facebook, said this was due to a "scheduling conflict." However, both Musk and Facebook potentially have a powerful stand-in at the meeting: Peter Thiel, the billionaire investor and Trump's top tech ally. Thiel is a board member at Facebook and longtime friend of Musk. He was listed as attending on behalf of his venture fund. 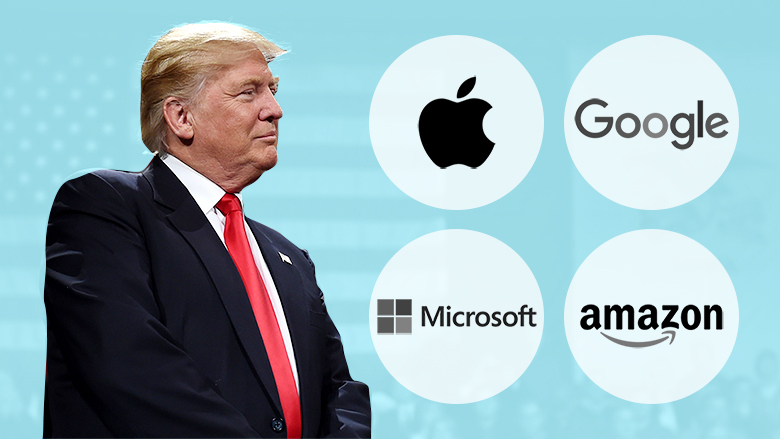 For most large tech companies, it's difficult if not impossible to sever ties with the White House completely. The federal government is a large customer for some of the companies and a potential regulator for all. Several also stand to reap billions from tax reform. Leading up to the meeting, some suggested tax reform could emerge as a topic on the sidelines. Gary Cohn, the director of the National Economic Council, was one of the White House officials in attendance. And as one lobbyist puts it, he probably wasn't there to "talk about cloud computing at the Veteran's department." One source who works with tech companies on policy issues stressed there continues to be issues like modernizing government where tech and Trump can find common ground even as they disagree on others. "It's very tempting to say f*** you. But those are decisions that are not easily reversible," the source said. Those eager to see tech execs do just that "are asking them to act like Trump instead of acting strategically and clever."